Episode #115: The Legion Of Super-Heroes! 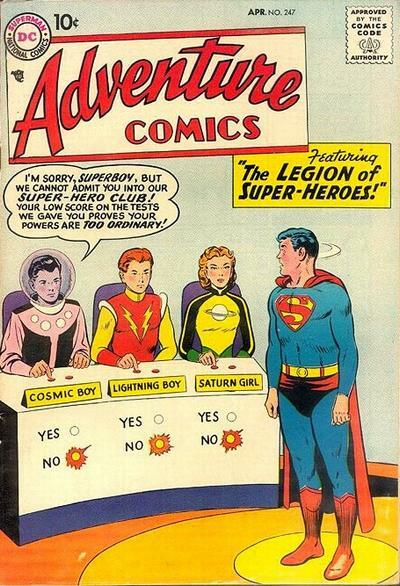 Adventure Comics 247, the first appearance of The Legion Of Super-Heroes! - The classic Legion era: through ADVENTURE COMICS 380, May 1969. - The "Disco" Legion, denoted by the art of Dave Cockrum and Mike Grell, whose art was published from SUPERBOY 184, April 1972 - SUPERBOY AND THE LEGION OF SUPER-HEROES 224, February 1977. - The Baxter Era Legion, so named because of the type of paper stock used in this Legion title, LEGION OF SUPER-HEROES 1 (Volume III), August 1984 - 63, August 1989. - The 5-Year Later Legion, named because it began 5 years, in story time, after the end of the Magic Wars which concluded the previous Legion title: LEGION OF SUPER-HEROES 1 (Volume IV), November 1989 - 125, March 2000. - The 3-boot Legion, after the third change in legion continuity, which began with LEGION OF SUPER-HEROES 1 (Volume V) - 50, March 2009. Also reviewed is current Legion stories and announced plans for the Legion for the near future, in the 21st Century at least, if not the 31st Century. Next Episode: HAPPY BIRTHDAY, IRWIN DONENFELD! Episode #114: Clark Kent's Forgotten Girlfriend! Title panel for the second story in Superman 165! 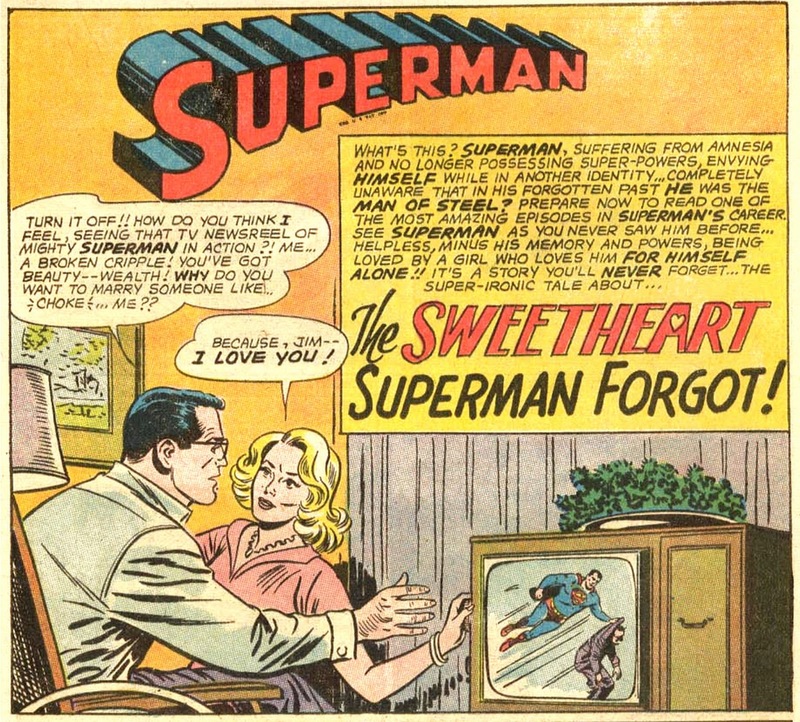 The featured Superman story for this belated Valentine's Day episode is THE SWEETHEART SUPERMAN FORGOT, the second story of SUPERMAN #165, November 1963, published around September 19, 1963. It was written by Superman co-creator Jerry Siegel and drawn by Al Plastino. It was reprinted in the trade paperbacks SUPERMAN IN THE SIXTIES and SHOWCASE PRESENTS: SUPERMAN vol. IV. Also featured is the cover story for the issue, BEAUTY AND THE SUPER BEAST, written by Robert Bernstein, pencilled by Curt Swan and inked by George Klein. This story wsa also reprinted in SHOWCASE PRESENTS: SUPERMAN vol. IV. Next episode: THE LEGION OF SUPER-HEROES! Episode #113: A Curt Swan Toast! Curt Swan was born on February 17, 1920 (NOTE: I mistakenly said 1910). 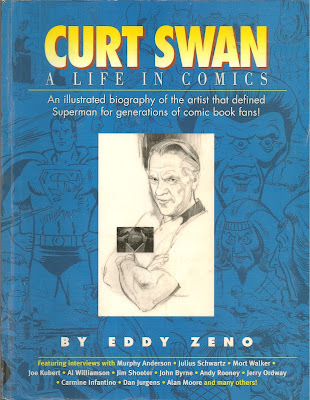 To honor his birthday this year I want to share some of their thoughts on working with Curt Swan, as recorded in Eddy Zeno's book, CURT SWAN: A LIFE IN COMICS. The comic pros mentioned here are Mort Walker, Murphy Anderson, Carmine Infantino, Julius Schwartz, Sheldon Moldoff, Elliot S! Maggin (no typo), Len Wein, Mark Waid and Joe Kubert. 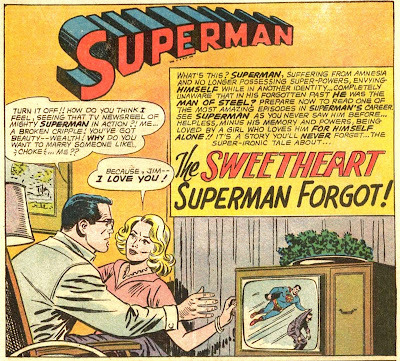 Next Episode: CLARK KENT'S FORGOTTEN GIRLFRIEND! Episode #112: Superman Vs. The Fiery Cross! Since February is Black History Month, I thought it would be appropriate to dedicate the first episode of the month to a very small, but notable, role Superman played in the civil rights movement. In episodes which ran from June 10 - July 1, 1946, Superman fought a racist organization called THE CLAN OF THE FIERY CROSS, which was the name of the story. The rituals and code words used by the Clan came from real life Ku Klux Klan, through the eyewitness accounts of Klan infiltrator Stetson Kennedy. This episode will summarize the plot of the radio show and a brief biography of Stetson Kennedy. http://www.ferris.edu/JIMCROW/question/july09/ NOTE: this website does not celebrate the Jim Crow era. It documents the history of the era from the perspective of civil rights. Next Week: A Curt Swan Toast!